This is perhaps one of my favorite cookies ever. It brings back many memories of family gatherings and shared meals. While I mostly remember my aunt and my mom making them, the recipe originated with my grandma and so I always think of her. I searched through her recipe box and found it written in her hand with a tiny note that this is a good recipe. Love that. 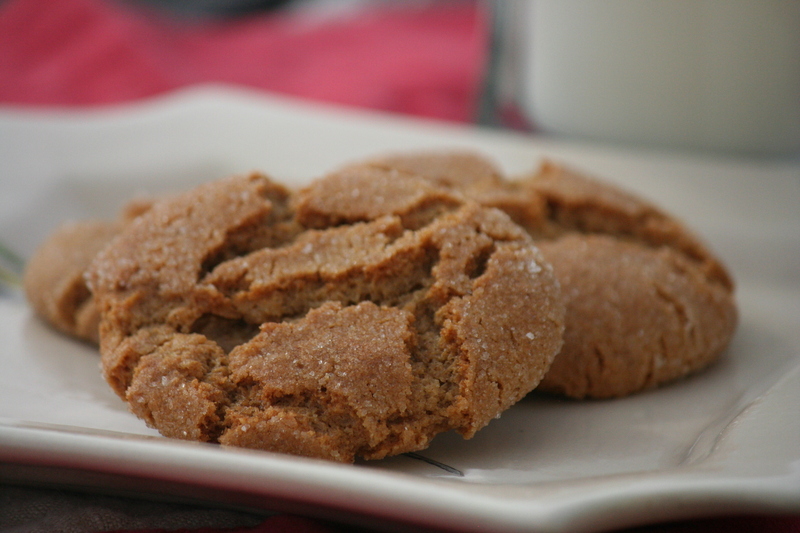 These are the perfect texture, the perfect combination of spices, perfectly sweet but not too sweet, and perfectly formed with "crinkles" on top. They are delicious warm or cooled. Stephanie even had these as favors at her wedding. Yes, I think it's fair to say these are a family tradition. Molasses Crinkles would be a great addition to your Superbowl Party (along with many of other appetizer and snack recipes!) but they would also be good just about any other day. Perfection. Cream shortening, molasses, sugar, and egg together until fully combined and creamy. Add flour, soda, salt, ginger, cinnamon, and cloves. Mix until fully combined. Scoop dough and roll into 1 inch balls and roll in sugar. Place on an ungreased cookie sheet and bake for 10 minutes or until crinkled on top and lightly golden. Makes about 3 dozen. I love these cookies!!!! I think they are best when you guys make them though!!! ;) I wonder if Stephanie has made a GF version -- that would be so good! Heather, I haven't tried making a gf version yet. But they are my favorite cookie, so maybe one of these days I'll tackles that!